The Village Voice’s First Annual “Choice Streets,” is approaching quickly. 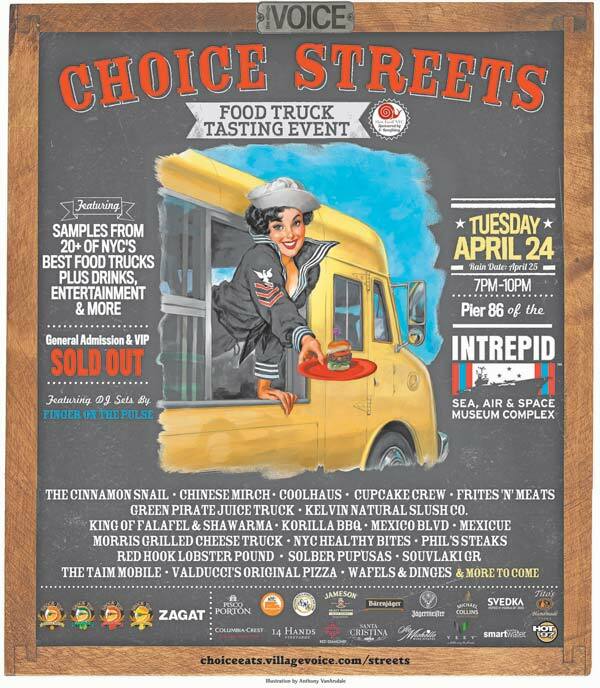 This tasting event features over 20 of NYC’s favorite and highly sought-after food trucks, all hand picked by The Village Voice. Attendees will be provided with complimentary food tastings from the food trucks, as well as complimentary beverages from various drink sponsors. There will be entertainment provided by DJ’s Finger on the Pulse. Participating food trucks include: Chinese Mirch, Coolhaus, The Cinnamon Snail, Frites ‘N’ Meats, Green Pirate Juice Truck, Kelvin Natural Slush Co., King of Falafel & Shawarma, Korilla BBQ, Mexicue, Morris Grilled Cheese Truck, NYC Healthy Bites, Red Hook Lobster Pound, Souvlaki GR, The Taim Mobile, Wafels & Dinges, along with the recent additions Bongo Brothers, Cupcake Crew, Mexico Blvd, Phil’s Steaks, Solber Pupusas, and Valducci’s Original Pizza. Sponsors for this event include Shock Top Beer, Zagat, Pisco Porton, New York City Food Truck Association, Southern Wines and Spirits, Jameson, Sidney Frank Importers, Svedka, Ste Michelle Wine Estates, Tito’s Handmade Vodka, Veev, Green Mountain Energy, Hot 97, smartwater, Wetpaint, Foodtoeat.com, Kind Bars, Frames, Zipcar, Nice Work If You Can Get It and Laser Cosmetica. Tickets for the event went on sale early March and was sold out in just 5 days. Luckily, I will be attending the event Tuesday evening and I’m definitely looking forward to it. Hope to see you there too!